Set a stew pan with plenty of water on the fire, sprinkle a handful of salt in it, let it boil and skim it; then put the asparagus prepared thus: scrape all the stalks till they are perfectly clean, throw them in a pan of cold water as you scrape them; when they are all done, tie them in little bundles, of a quarter of a hundred each, with bass, if you can get it, or tape; cut off the stalks at the bottom that they may be all of a length; when they are tender at the stalk, which will be in from twenty to thirty minutes, they are done enough. Great care must be taken to watch the exact time of their becoming tender; take them just at that instant, and they will have their true flavour and colour; a minute or two more boiling destroys both. 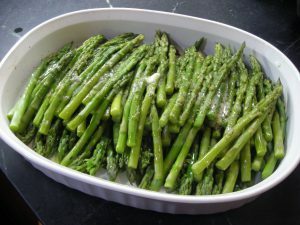 While the asparagus is boiling, toast a round of a loaf of bread, about half an inch thick, brown it delicately on both sides; dip it lightly in the liquor the asparagus was boiled in, and lay it in the middle of a dish; pour some melted butter on the toast, and lay the asparagus upon it; let it project beyond the asparagus, that the company may see there is a toast. Do not pour butter over them, but send some in a boat. Leni Says – Just about all I do to prepare asparagus is a quick rinsing, a steaming and a buttering. But really my version is just a short hand version of MR’s. I trim them and then steam the whole bundle at the same time. 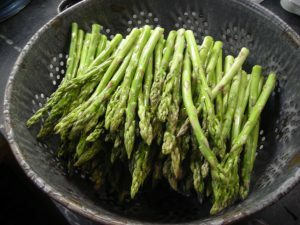 The asparagus that is usually available today is far too skinny to ‘scrape’ or peel. 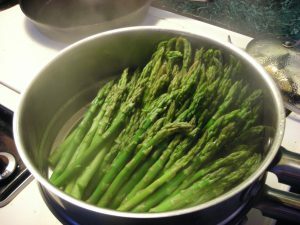 MR assumed the cook was preparing a great deal of asparagus at one time so the bundle method would help keep the stalks from becoming twisted like pasta during the cooking in all that water. Bundles of twenty-five are impressive! She wanted to make sure the larger and perhaps tougher stalks were clean and scraped to help make sure that all the stalks got tender at the same time. The more mature the asparagus plants the thicker the stalks. Asparagus stalks harvested from well established beds are fairly uniformly large and with proper care an asparagus bed might produce for well over twenty years. My take is that with such a large batch she chose to ‘boil’ the bundles in a large pot of water so there was plenty of room. The bundles could be pulled out by the tie and checked for doneness. And I think the twenty minute cooking time might be what was needed to cook the tied bundles. It takes all of 15 minutes for my steamed version to be ‘just right.’ Her emphasis on watching carefully is the best clue to what she expected her cooks to be expert in – timing and experience with the right color. MR’s presentation of the finished dish on a bed of toast is interesting. Come early spring in the Piedmont and the Tidewater, menus in gentry houses would all begin to feature asparagus. Dishes such as MR describes would often be paired within the table setting, set opposite each other at angles, and even at the four corners of the table, for best effect. So when she says the company should be able to see the toast she has a definite visual effect in mind; the bright green asparagus – freed from its tie and laid carefully across the large buttered toast platform. Also she has envisioned that the kitchen ordinarily contained round bread that could be sliced in such a way to create that delicately browned and buttered stage set. Whether such round loaves were usual throughout the year at least in the spring during asparagus season the cook needed to make sure that among the other baked goods there were round loaves. Skimming salted water: salt used to contain many more impurities than we have come to be used to today. When boiled the impurities would rise to the top of the water as a grayish scum which could be skimmed off with a spoon. Bass: a type of African raffia used for tying (as we might use twine) and for brooms. It could be bought by the roll or bundle. Tape: thin woven cordage (if tied with a bow it could be used over and over in the kitchen). Growing asparagus: I’ve had several asparagus beds over the years – some more productive than others. The last asparagus bed is now a cold frame. For now I depend on local sources since my family mostly eats asparagus only in season in any case, with Easter Sunday the highpoint. Only rarely when I want to make a very special stir-fry will I buy a small bunch of asparagus out of season.